This seat of the barons of Saye, which lies 2¾ miles from Banbury, is believed to have been founded (29 Edward I, 1301) by John de Broughton, who had a charter of free-warren here and elsewhere in the reign of Edward I., and the style of building perfectly agrees with this date (Parker). Sir Thomas de Broughton was in possession here in 1369, but, probably, soon after that date, William of Wykeham, who was made Bishop of Winchester in 1366, purchased Broughton of that family, and settled it on the family of his sister Agnes, who was married to William Champneis. She had a daughter, Alice, who became the wife of William Perot, and we find their son, as Thomas Wickham, armiger, obtaining a licence from Henry IV. in 1406, two years after the death of the bishop, his great uncle, to crenellate his house of Broughton, he having assumed the name of Wykeham, and being afterwards knighted. Sir Thomas’ son, William Wykeham, had a daughter and heiress, who inherited Broughton, and married William, second Lord Saye and Sele (killed at Barnet, 1470, thus bringing; the property into her husband’s family, where it still continues after four and a half centuries of possession. 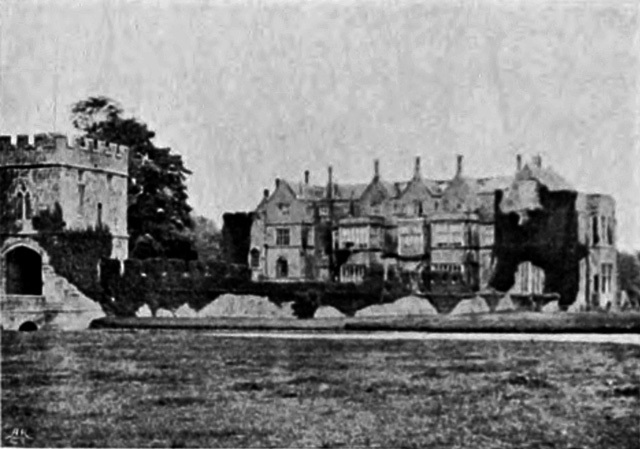 Much historical interest must ever attach to two localities where the leaders of the puritan and malcontent party in the reign of Charles I. held their secret meetings, which resulted in the civil war; one of these was Broughton Castle, the house of the Lord Saye and Sele, about whom Clarendon wrote that he “had the deepest hand in all the evils that befel the unhappy kingdom”; the other .was Fawsley, the home of Richard Knightley, whose eldest son had married the favourite daughter of Hampden. At these two places, Pym, Hampden, St. John, Lord Saye and Sele (who was considered “the godfather of the puritan party”), Essex, Lord Holland, Nat Fiennes, and others of rank, held their meetings. At Broughton there was a chamber to which a private passage led, and when these conspirators assembled in it they came secretly, and no servants were allowed to know anything as to the attendance or the business. The family of Saye is of ancient derivation, and is traceable, through females, to the eleventh century. Geoffry de Saye was one of the twenty-five barons charged with the care of the observance of the Great Charter. What is said by Beesley (in a long note) regarding this family having originated from the worthless scoundrel, Falk de Brent (Falcasius de Breaute), the servile tool of King John, is not trustworthy: Breaute could not be Broughton. In Parker’s “Domestic Architecture of the Fourteenth Century” (vol. ii. p. 261) a very full description is given of Broughton Castle, with a plan of the house and several views of it. The structure is entirely surrounded with a very broad moat, perhaps the largest in the kingdom, the only entrance being by a bridge and gatehouse on the S. side. Viewed from the N.W. it has the appearance of a fine Elizabethan mansion, but this is due to alterations at the W. end, and to the grand bay windows added by the Fiennes family in 2 Mary. On examination it will be found that almost the whole of the main building of the De Broughtons of the fourteenth century still remains in complete preservation, particularly at the E. end. The great hall is there with its solar, the kitchens beyond this being converted into magnificent dining and drawing-rooms, with the addition of the great bay windows. Then, from the S.E. end of the hall, a splendid groined corridor runs to the end of the ancient house and round to the S. front, giving access to the other rooms, and, by a newel staircase, to the upper floors. The chapel, which is on the upper storey, is approached by a long flight of steps from this passage; it is small, but occupies the height of two storeys, and has a fine geometric E. window. On the roof are two apartments: one with a good chimney, which is called the guardroom; and another large apartment occupying the whole roof of the E. end, which is called the barrack, and was occupied the night before the battle of Edgehill by Lord Saye and Sele’s regiment. The work of the fifteenth century, by Sir Thomas Wykeham, must have been the walls within the moat and surrounding the whole (portions of Which remain), the offices adjoining the gatehouse, and the upper storey of this (the lower storey being De Broughton’s work), the embattled part containing the kitchen, the guardroom, and the windows of the room over the chapel.